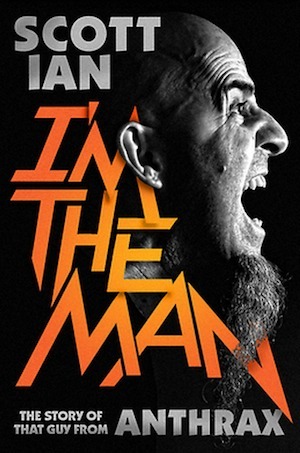 If a band ever wants to beef up a tour, all they need to do is add Anthrax to the bill. Though, that band should be prepared because whether Anthrax goes on first, second, or twentieth…they are going to steal the show. 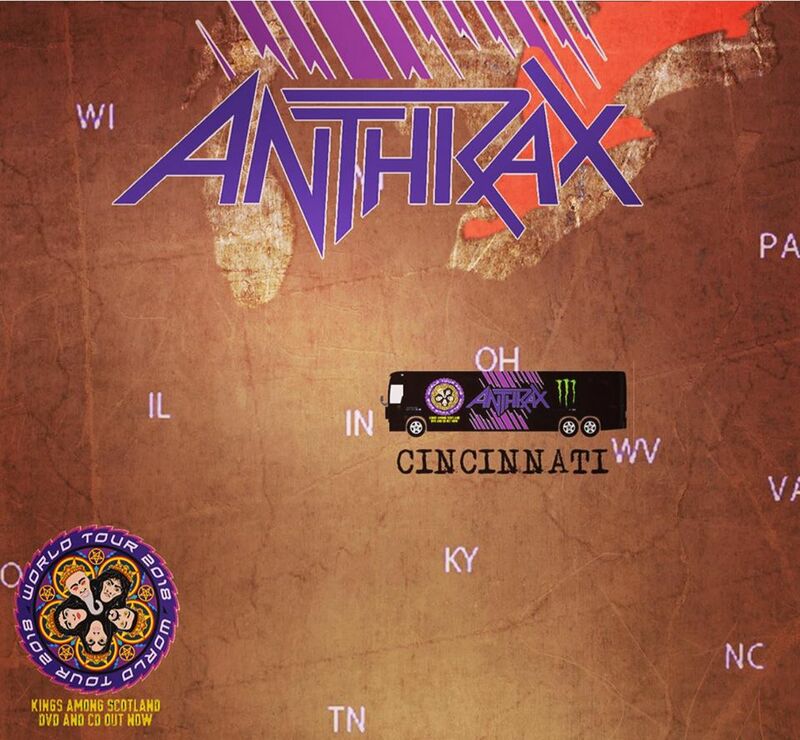 That is exactly what happened last Wednesday night in Cincinnati, OH when Anthrax came storming into the Queen City. 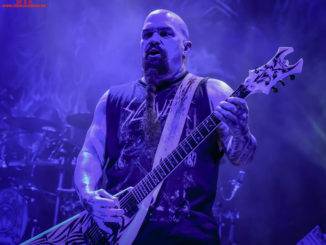 The show was billed as Slayer’s “End of Days” tour, and the lineup was stacked with Testament, Lamb of God, and Behemoth. But when Anthrax took the stage in the second slot of the evening…the bar was raised high for all of those other bands to reach for. The setlist only consisted of seven songs, but seven songs were all that Anthrax needed to show why they are one of the elite “Big Four” of thrash metal. Each song was big. Each song was fast. And each song was played with the same intensity and fire that the guys had back in 1984. 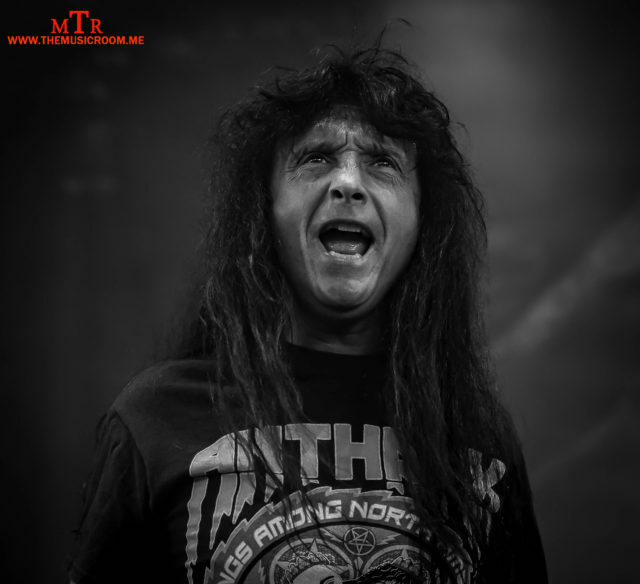 Lead vocalist, Joey Belladonna sounded just as strong and powerful as he did when the band played with Slayer in 1991 on the “Clash of the Titans” tour. In fact, he is one of the rare instances where a front man may be even better today than he was back then. The rest of the guys played like they were a new band with something to prove. It was clear from the first note of “Caught in a Mosh” that Anthrax would not be half-assing anything. 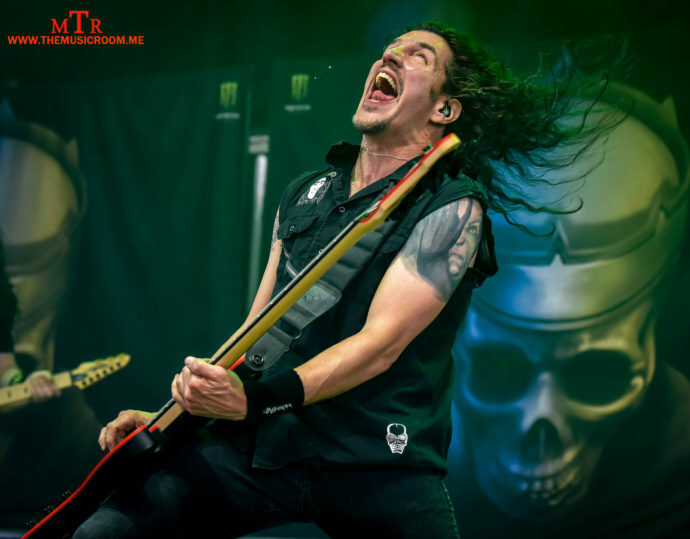 All one had to do was watch bassist, Frank Bello to see that Anthrax is still giving 100% to their craft. From the time he took the stage, Bello was like a bolt of lightning full of purpose. He had the kind of energy that men half of his age wish they could possess. There is no question that Anthrax has had its share of struggles and setbacks over the years. However, the band that took the Riverbend stage on this night in 2018 seemed comfortable in their own skin. In fact, they seemed like a group of guys we were having a hell of a lot of fun. 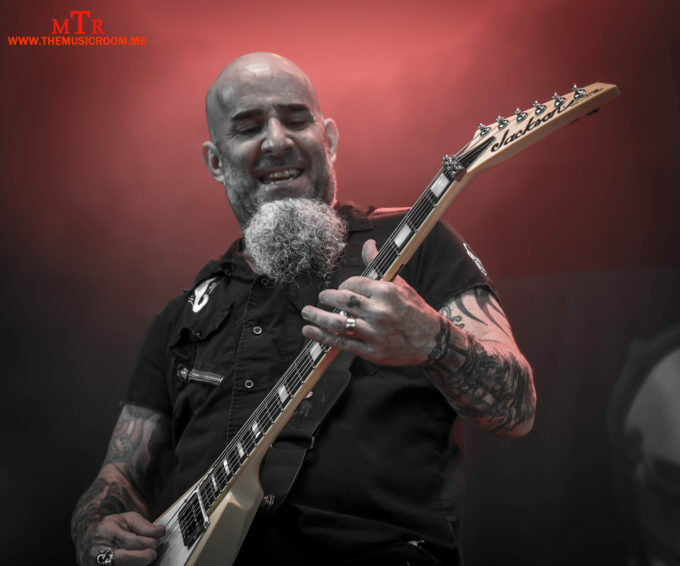 Thrash metal isn’t considered to be happy music by any means, but guitarist Scott Ian had a huge grin on his face most of the night. That says a lot about a band that has been doing this for nearly forty years now. To be playing their kind of music, and at the level that they are playing it at…that is saying something. At the core of that phenomenon is Charlie Benante. This cat is about as cool as they come. What else can you say about Charlie? Sure, you can say he is the drummer in the band. But he is really much more than that. 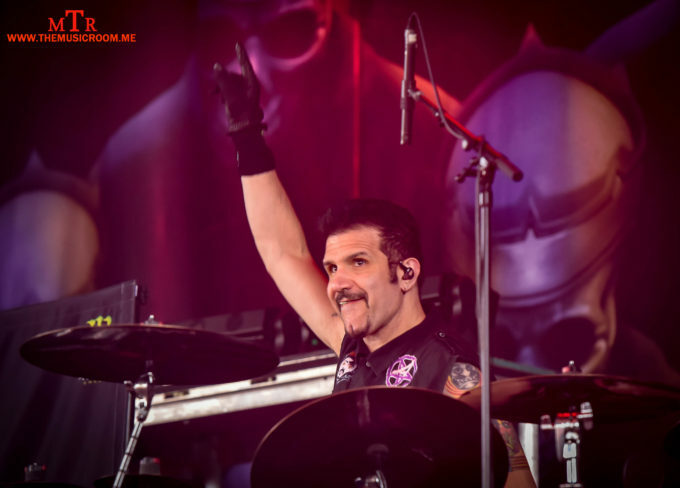 I dare to say that Charlie Benante is the heart and soul of Anthrax. I will go one further to say that he has not lost one beat over the years (pun intended.) 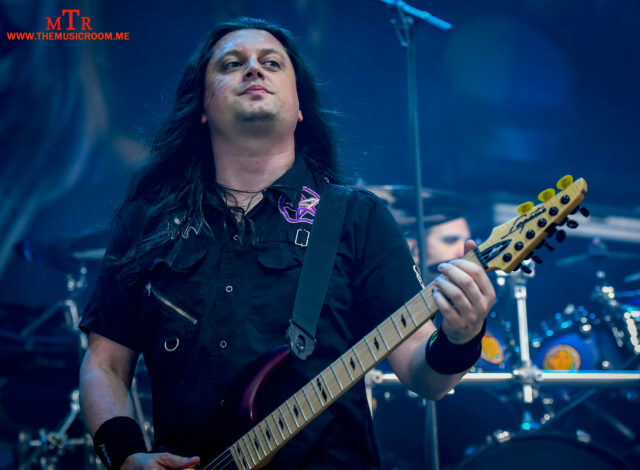 And while the four men mentioned in this piece are original to the “classic” line up, lead guitarist Jonathan Donais was a welcomed addition to the band. Donais held his own among his legendary bandmates and showed that he has the goods to play alongside them. Considering that Anthrax just released one of their strongest records to date with 2016’s “For All Kings,” the band shows no signs of slowing down now. And if you missed this show, and cant get to a tour stop this summer….you are in luck. Anthrax just released a live DVD/cd called “Kings Among Scotland” which features classic Anthrax songs, as well as the album “Among the Living” in its entirety. The collection is the perfect reminder of seeing that killer Anthrax show from this summer or is the best way to hold you over until the next tour comes to town. Either way…it’s a must have!